This report is a thorough examination of the billions upon billions of mobile ad impressions served on Smaato’s platform during the first half of the year (January through June, 2015). 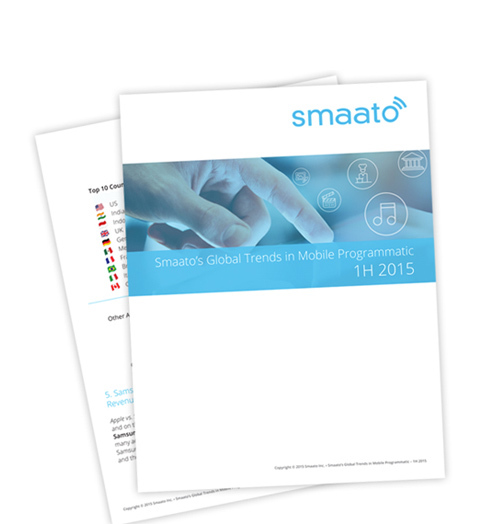 Smaato serves up to 6 billion ads each day, across 600 million mobile users around the world each month. The global explosion in mobile web usage is driving newer and larger ad sizes that are contributing to increased revenues on the Smaato Exchange. Consumer adoption of mobile devices worldwide is also driving the growth in mobile ad spending. According to eMarketer, there will be more than 2 billion smartphone users worldwide by 2016, over one-quarter of whom will live in China. Mobile web usage is soaring. While apps still lead overall and spending is up in both areas, ad spending on the mobile web doubled in the past year to hit 38 percent of the market; while the percentage spent on apps dropped to 62 percent from 72 percent last year. Larger ad sizes are surging in popularity in 2015, reflecting strong growth in mobile web usage worldwide, especially in developing markets. Publishers and app developers who make room for Rich Media in their apps and on their websites are making 83% more money than those who don’t. Age and gender targeting is the future of mobile targeting.